Need a safety hat with a wide brim? This one is perfect. With a large round design, it provides 360 degrees of shade around your head. It has a chinstrap to enable you to keep it in place. The chin strap is ideal if your staff are on a constant move and also located in strong wind areas. This quality bucket-style hat is made of a comfortable, breathable polyester/cotton material. The hat comes in two different fluorescent colours--- green and orange. It is available in four different sizes; S, M, L, and XL, to enables a perfect fit for all. The cap is lightweight and the toggle to the strap comes in the same colour as the hat. Maximise visibility, without compromising on comfort. This cap is perfect for school traffic attendants, workman out on the roads, building sites or construction sites. 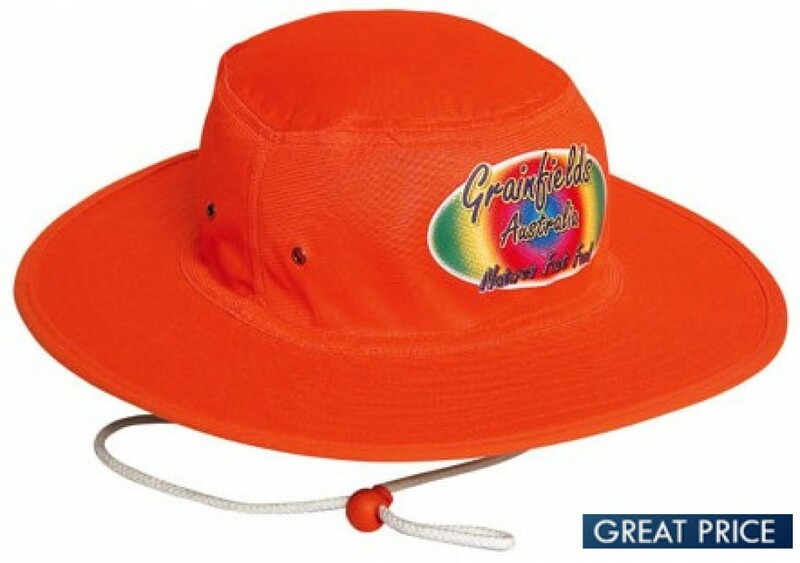 High Visibility hats are designed to attract the eye, so why not put your brand where it will be seen? When you order today the price listed includes this hat branded with embroidery up to 8000 stitch count. You may also choose to have additional embroidery on the back or around the brim. For a free quotation with your branding requirements, contact us today. When you supply your logo file to use, please email through an eps or pdf. We can also accept high-resolution jpeg. We will close match the colours of your logo and send through a mock-up of the embroidered design, for your approval. The prices exclude GST. These caps are stocked in Australia, ready to be printed, allowing for a fast 1-week delivery. We deliver to all addresses in Australia -- ACT, NSW, NT, QLD, SA TAS and VIC. Our couriers will require a signature, so we cannot deliver to PO boxes. Deliveries to Australia only. An embroidery set up $50+gst applies for bulk orders below 50units.